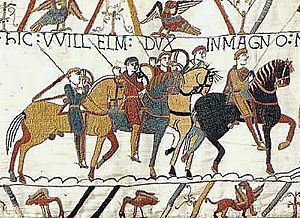 The Norman conquest of England was a military invasion of England by William the Conqueror in 1066. William was a Duke who ruled Normandy, now a region in France. He invaded England after the death of King Edward the Confessor because he believed he had the most right to be King of England. But King Harold II had himself crowned king instead. King Harold, with his Saxon army, and Duke William fought at the Battle of Hastings on October 14 1066. King Harold was killed in the battle and his army left. On December 25 1066 William was crowned the new King of England. The Norman conquest brought an important change in English history for a number of reasons. The conquest linked England more closely with Continental Europe, and made Scandinavian influence less important. It created one of the most powerful monarchies in Europe. The conquest changed the English language and culture, and set the stage for rivalry with France, which would continue (with breaks) until the 19th century. Norman conquest of England Facts for Kids. Kiddle Encyclopedia.